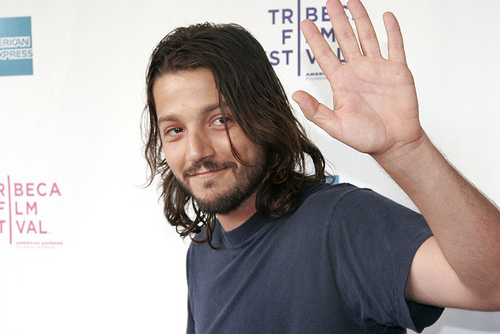 Unlike the last movie star who showed his face ‘round these parts , Latin American actor and producer Diego Luna  is probably not going to draw the same massive crowd of hysterical young women. Which in all honestly is probably a good thing, seeing as how some of you ladies (and gentleman, since we don’t want hate mail showering Eshleman) seem to be unaware that deafening, maniacal shrieking isn’t flattering … it’s weird. Very, very weird. And scary, quite frankly. Luna – star of the classic Mexican coming of age film “Y Tu Mama Tambien ,” co-star of the Oscar winning biographical film “Milk ” and (more importantly) boyfriend of Katy Perry in her new video “The One That Got Away”  – will be presenting a screening of “Miss Bala,”  a critically acclaimed film which he co-produced. In a really bland nut shell, “Miss Bala”  is a thrilling story of a beauty pageant contestant who gets caught in the middle of a Mexican drug war. After the film, Luna will talk art and social change in a Q&A session that you may still submit questions  for. The free screening takes place tonight at Wheeler Hall. Tickets will be available at the door on a first-come, first-served basis beginning at 5 p.m. today. Doors open at 6:30 p.m.